View An anniversary trip to Germany on ToonSarah's travel map. 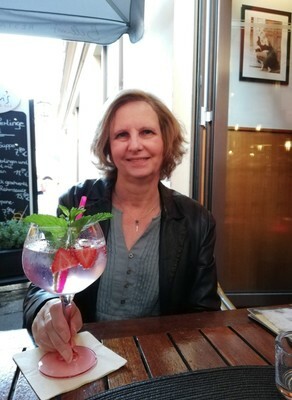 Our last full day in Leipzig, and also our wedding anniversary - 37 years and counting! So our day started with the exchange of cards before the usual excellent Fregehaus breakfast. It was bright and sunny as we left the hotel, the air fresh but the promise of another hot day to come. We started off across the Marktplatz where for the first time I spotted a plaque set into the cobbles. It describes Leipzig’s important location on the intersection of two trade routes – the Via Regia (the most important link between eastern and western Europe) and the north-south Via Imperii. The market was established here at the point where the two routes cross. We passed the Thomaskirche, stopping for photos as the light was so good (even though we already had some from several previous occasions). We realised that someone had given Bach a flower to hold (we hadn't spotted it on previous visits! ), so that meant more photos were necessary! For the first time we then walked beyond the church, along Burgstrasse in the direction of the Neues Rathaus, as its tower had appeared so striking in the views from the City Hochhaus yesterday, passing some interesting old buildings along the way, and some newer ones – some so new they were still under construction! This ‘New Town Hall’ was built at the start of the 20th century to replace the old one in Markt, to cater to the needs of a growing city. One of the first things we saw as we arrived was the entrance on the west side reserved for wedding parties, with a portal decorated with little cherubs and a wedding car, an old Lada, just drawing up. I didn’t get a photo of the bride and groom (an older couple) but I did capture the beautiful flowers on their car - very apt on our own anniversary. The Neues Rathaus was designed by the architect and city building director, Hugo Licht, who also designed the Runde Ecke and the Priests’ House at the Nicholaikirche, both of which we had seen on our first full day in Leipzig. It was built on the site of the Pleissenburg, a 13th century castle which had in the past been used as a barracks, an administrative centre and an art academy. A condition of the award of the site for the new town hall was that the old Pleissenburg tower be incorporated into its design. Thus Leipzig’s Neues Rathaus has the tallest city hall tower in Germany, at nearly 115 metres. I unearthed two very different interesting facts about this building. One, that it appeared as a backdrop in Alfred Hitchcock’s film ‘Torn Curtain’. And two, less pleasantly, that it became notorious as the site of numerous mass suicides during the last days of the Third Reich. We were fascinated by the fountain, sadly without water, on the east side near the Rathaus Keller. The sign on its rear side said only that it was to commemorate the unveiling of the new town hall in October 1905, making no mention of the subject matter. My initial guess was that this was the Pied Piper of Hamelin, but on closer inspection I could find no rats among the various animals depicted, nor could I guess at a connection between that city and Leipzig. Later research shed only a little more light on this Rathausbrunnen. Many of the figures on the lower circle, which (when the fountain is functioning) spout water, are taken from fairy tales. The upper group was described as ‘consisting of a flute player with two boys playing at his feet’, which it clearly does. My source, the Leipzig Lexicon, goes on to say that because of this, the fountain is sometimes called the Rattenfängerbrunnen or ‘Pied Piper fountain’ after the fairy tale ‘The Pied Piper of Hameln’ – so I was not so far wide of the mark! Leaving the Neues Rathaus we took a tram to Connewitz, an inner city suburb to the south of the old town which I had read was a good place to find street art and which also had a pleasant café. We started our visit in the latter, the Café Südbrause, where I had a lovely yoghurt shake with cranberries and blackcurrants, and Chris an apple juice, sitting in the pleasantly shady garden. We then strolled round some of the nearby streets, coming across some street art but not a huge amount. But the architecture was also interesting - I liked this old school building, for instance. As in many other places where a previously rather neglected area has recently been ‘discovered’ by young professionals, artists and the middle classes, those who have lived in Connewitz for many years are not necessarily pleased about what the Germans call Gentrifizierung – gentrification. From Connewitz we took a bus to the Völkerschlachtdenkmal, a huge and rather bombastic monument to the fallen of the Battle of Leipzig (also known as the Battle of the Nations) in October 1813. This battle resulted in one of Napoleon’s final defeats, against a coalition of armies from Russia, Prussia, Austria and Sweden. Around 600,000 soldiers from more than twenty countries took part in the battle and 100,000 of these were killed or wounded. Furthermore a typhus epidemic broke out in Leipzig, killing 10% of the city’s population. Napoleon’s defeat saw him retreating to France, and when the Allies invaded the following year he was forced to abdicate and was exiled to Elba in May 1814. The monument was built to coincide with the 100th anniversary of the battle. There had been talk of a memorial to the battle as early as 1814, just one year after it was fought, but for years it was just that, talk. A foundation stone was eventually laid in 1863, to mark the fiftieth anniversary, but still no monument was built. Eventually, in 1894, things started to happen. An association was formed, donations sought, and in 1898 construction finally began, to a design by Bruno Schmitz. The resulting monument stands 91 metres high and is one of the tallest monuments in Europe. 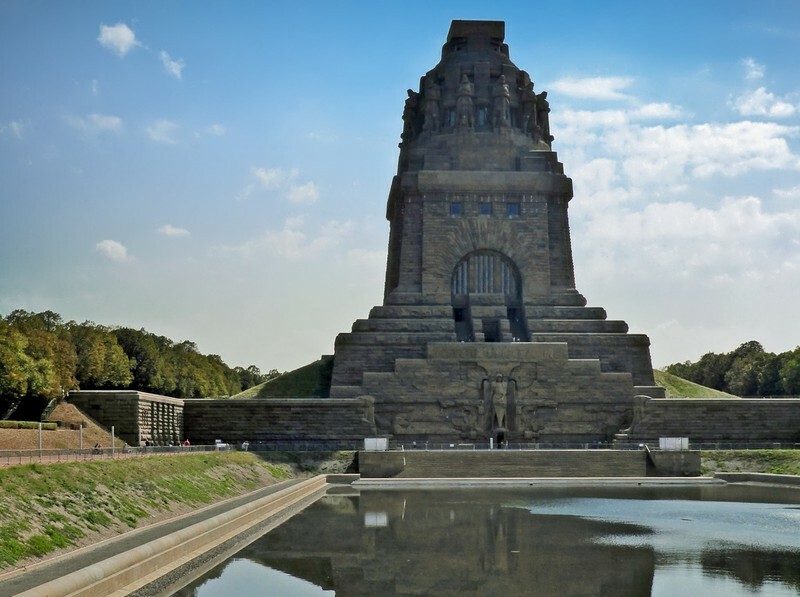 It was inaugurated on 18 October 1913 in the presence of emperor Wilhelm II. On the front of the monument is a huge figure of the archangel Michael, portrayed as a god of war. Other carvings are similarly war-like – an eagle in flight, a charging horse. You enter beneath the feet of the archangel and start your visit with a look at the massive foundations which support this structure. It is usually possible to access the lower of the two outside viewing platforms by a series of lifts, but notices warned us that at the moment the lower lift wasn’t working so after viewing the foundations we had to climbed about 90 stairs to the crypt – a small challenge to my still bruised ribs but manageable. The Crypt is decorated with eight large statues representing fallen soldiers, either side of which stand the Totenwächter (Guardians of the Dead). Small side rooms here display various artefacts, including Napoleon’s desk. On the upper storey, known as the Ruhmeshalle or Hall of Fame, are four 9.5-metre statues symbolising the idealised German qualities of faith, fertility, bravery and sacrifice. The lift, which from this point on was operational, bypasses the Hall of Fame to whisk you to an inner viewing gallery from where you can look down on the Crypt and on those figures. The lift then took us further still to an outer gallery with great views towards the city and of the surrounding countryside. You can, if you prefer, climb stairs all the way to this point rather than use the lift – more about those stairs later! 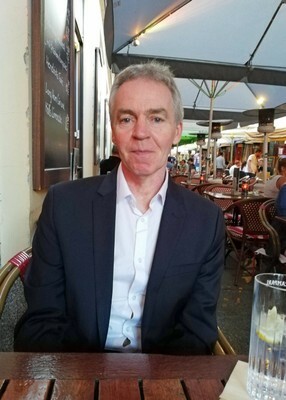 After we had walked completely around the gallery Chris decided to go on up to the very top, but as that involves a long climb on steep and narrow stairs I decided that my ribs would be better served by passing on that. While I waited for him I circumnavigated the gallery a second time, looking not out and down but up, at the immense stone figures looming above me, the Wächterfiguren (Watching Figures, i.e. guards). Meanwhile Chris was up above me also taking photos so that I could see what I had missed out on. 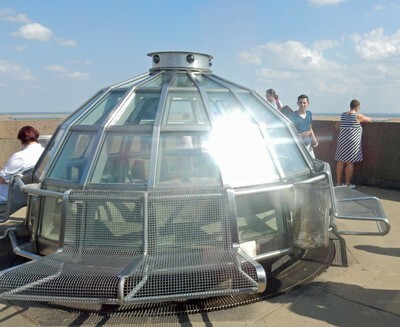 The view was of course much the same, albeit from somewhat higher up, but he found it interesting to see the small cupola which tops the monument. He has given permission for me to share these photos here. When Chris returned we took the lift back down to the Crypt level, from where I felt able to tackle what looked like a short climb to the Hall of Fame, to get closer to the huge statues there. We started up the spiral staircase (one way only - another flight leads down) at the foot of which we had seen a sign with a cross-section of the monument showing the Hall of Fame as the next level. But in thinking that this meant that these stairs would take us there we were mistaken. The stairs went on and on, my ribs started to feel sorer, retreat (because of the one-way system) was impossible. Eventually we arrived at the top - only to find ourselves, unsurprisingly given the length of the climb, back up at the inner gallery, looking down on the very figures we had hoped to reach! So we gave up, took the lift back down, and started towards the stairs back down to foundation level. Near the start of these we spotted an exit door to a lower outside platform, went to investigate, and there we saw what had previously not been at all obvious – the steps to the Hall of Fame went up the outside of the monument! So we got our close-up look at those massive statues after all! Chris's hand on a toe of one of the statues in the Hall of Fame - to show the scale! After all these exertions we decided to skip the museum, which we knew mainly focuses on the story of the battle - a story I could read later online, and which Chris, having little interest in history, was happy to know little about. The sun had moved round during our visit, so on leaving we were able to get some better shots of the entirety of the monument. Its shape reminded us forcibly of the temples of Tikal, so much so that we speculated whether these had been an influence for the architect, although I have read that the main influences were Egyptian and Assyrian, especially the pyramids of the former. We caught a tram back to Augustplatz, which took us past the Russische Gedächtniskirche - the Russian Memorial Church. This was built in 1913 to commemorate the approximately 130,000 Russians who fought against Napoleon in the Battle of the Nations in 1813. I snatched a quick photo as we passed. When we got off the tram we walked through to Markt, where we stopped for Kaffee und Kuchen, that wonderful German institution, at one of the cafés around the square - Chris got his favourite plum cake, Pflaumenkuchen, and I had an excellent concoction of chocolate sponge, cream and apricots. Our final stop of the day was a short visit to the museum in the Town Hall, mainly because it would give us an opportunity to see inside a building whose external glories were hidden from us. We expected to have to pay, but the lady in the shop said it was ‘free today’ (she was unable or unwilling to explain why but I have since learned that there is free admission on the first Wednesday of every month – normally it costs 6€). I was pleased to be told that photography is allowed here as long as no flash is used. The exhibits are on two floors. On the first they cover the period from medieval times until the Battle of Leipzig. At the heart of this floor is the large banqueting hall, with impressive stone fireplaces and portraits of all the city’s rulers around the wall. 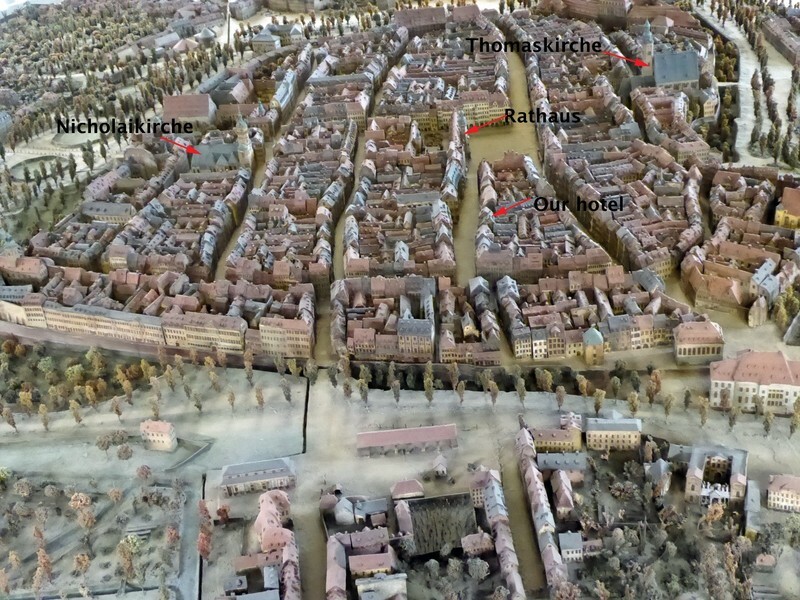 In the centre is an interesting and very detailed model of medieval Leipzig, in which we were able to pick out the roof of our hotel, the 16th century Fregehaus. [I have labelled some of the places of interest, and our hotel! Also displayed in this room is a hand-written copy of the Sachsenspiegel, the 13th-century law-book and custumal of the Holy Roman Empire, one of the earliest texts in German. Although this isn’t one of the four surviving illuminated copies of this (these are in Heidelberg, Oldenburg, Dresden, and Wolfenbüttel) it is still pretty awesome to look at a book this old! 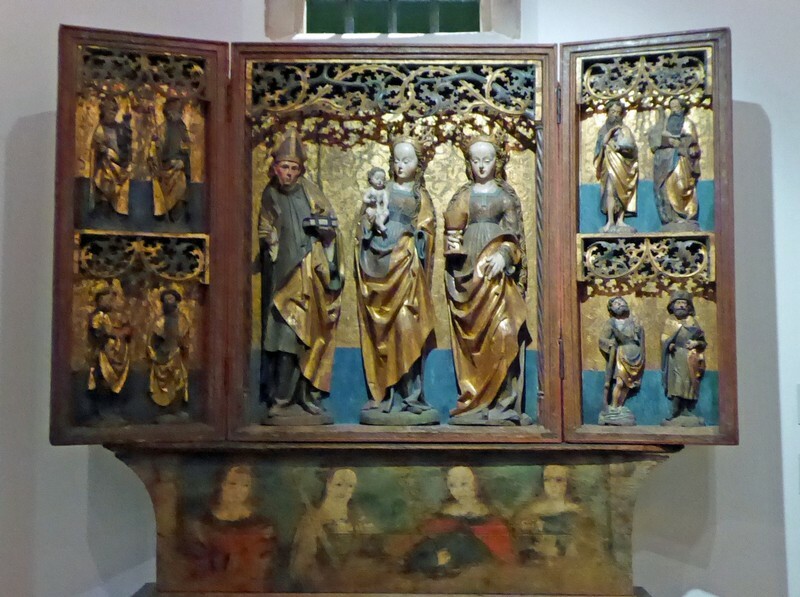 There are also Roman artefacts and some interesting objects and texts from the period of Martin Luther, when Leipzig was an important centre for publishing. Luther is known to have visited the town seven times. Somewhat weary (I with my aching arm and ribs, Chris with a distinct lack of interest in history! ), we decided not to bother with the second floor, which covers more recent periods, but instead headed back to the hotel to rest and freshen up before our anniversary evening out. Having read consistently good reviews of this restaurant we had reserved a table when passing yesterday for this evening’s anniversary dinner. Before going to the restaurant we stopped off at Bellini’s, the bar where we had enjoyed our first beer on arriving in Leipzig a few days ago, for pre-dinner drinks. I had a pink gin with fresh strawberries and Chris a vodka tonic. We then walked across to the restaurant on the north side of the Marktplatz and were shown to a table just inside, with a view of the square. The menu here is what I guess you would describe as ‘modern German’, with some influences from elsewhere in Europe. We both enjoyed everything we ate - the complementary potato Schnitzel amuse-bouche; my salmon tartare with pumpernickel bread and scrambled egg to start, and Chris’s Parmesan soup; his Butterschnitzel with potato salad, my perch on a bed of spinach with lobster sauce; and the warm chocolate fondant with cherries which we both chose as dessert. I drank a very good dry Riesling and Chris a red wine from the Palatinate region, and we finished the meal with our newly discovered favourite, a Radeberg Bitter each. We then had a little stroll around the market square before heading back to the hotel - tired, very full, and very satisfied with our last evening in Leipzig. We made the most of our last Fregehaus breakfast the next morning, enjoying as always the selection of cheeses and meats with the excellent selection of rolls, and today with the addition of juicy fresh figs to accompany some sharp goats cheese. We had an hour or so to kill before leaving and Chris wanted to buy a slice of his favourite plum cake to take home. We thought the market might be in operation (I had read that these take place on Tuesdays and Thursdays) but the Marktplatz was empty, so we walked past the Nicholaikirche one final time to a shop we had previously spotted near the Augustplatz, Lukas. We bought a couple of slices to go, and retraced our steps, taking a few last photos as we went. We checked out of the hotel and caught the S-bahn from Markt to the airport, arriving in plenty of time for our flight. The plane (a Bombadier) was so small that our larger cabin bags were taken from us as we boarded to be put in the hold, to be returned to us on landing. The short hop to Frankfurt went smoothly, and there we had time to grab something to eat - Frankfurters (appropriately!) with potato salad, my favourite German ‘fast food’. 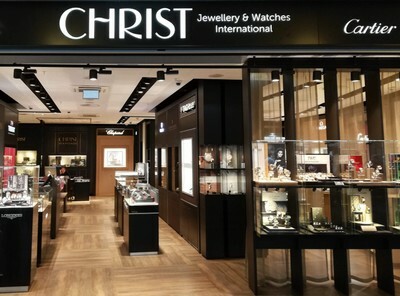 I also spotted a shop with an amusing sign - Jesus seems to have branched out from his traditional role and is now selling watches to make ends meet! The in-bound flight was a little late landing, so we had a delay of about 15 minutes before boarding and were similarly late in taking off. Surprisingly for a short economy flight these days, we were served complementary food (not that we were really hungry) and drink. I accepted a cheese sandwich and enjoyed a beer with it. I amused myself during the flight with taking photos of some impressive cloud formations. Soon we were landing at Heathrow and, with no bags to collect and no queues at the e-passport gates, were quickly on our way home by Tube. Another, short, holiday was over. My cousin Manfred used to have a Lada, which he was able to buy after several years on the waiting list. But on my first visit to Leipzig, in the 1960s, he didn't have the Lada yet, so he drove over from Nordhausen in their old Trabbi to pick me up. Your photo gives real meaning to "big toe." Fascinating trip and a fun anniversary. Wonderful account of your Anniversary in Leipzig! Your wonderful photos captured marvelous art in many mediums: street art murals, sculptures, architecture and I'd say even the food! Nice work, Sarah! Thank you all I agree Sylvia, the food is art too! Happy anniversary! Congratulations on 37 years. We have been married for 30. Thanks Irene Time flies when you're having fun, doesn't it?! That's a stunning memorial; it looks as if every visitor takes exactly the same photos as those who went before! Well worth the trip to the top. That's a good point Rosalie - I assumed he would be depicted with the rats but of course the children here could be meant for some of those he 'stole' But I still don't think there's a particular connection to Leipzig - maybe the sculptor simply liked the story!